Chilly nights and icy mornings are not exactly conducive to a good night’s sleep – especially if you are a very small person. 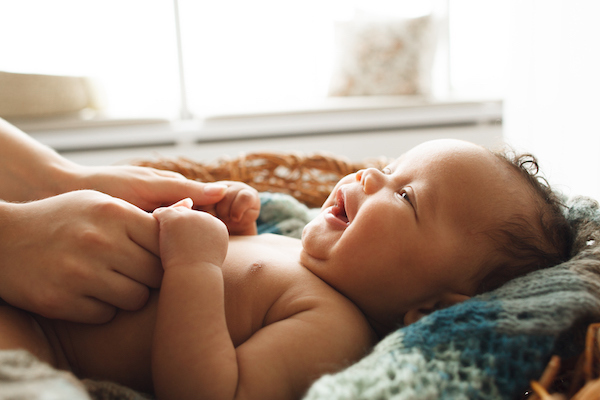 Here are some helpful tips on keeping your baby snug as a bug on wintery days – and hopefully getting a good night’s sleep yourself in the process. The simple rule of thumb when it comes to keeping babies warm at night is to dress your baby as you’d dress yourself. Avoid hats or beanies at bedtime as your baby moderates their body temperature through their head – and they could overheat. Instead, dress your child in a sleep suit and swaddle or sleeping bag for best results. If your baby is a little older and not keen on swaddles or being zipped up – and perhaps prone to kicking the covers off – dress them in enough clothing to keep them warm in the room without blankets. A little clever preparation will hopefully pay off in extra sleep! Let’s get down to specifics and talk about excellent bedtime attire. Nothing beats an all-in-one Gro-suit for simple, sensible base layer warmth. Not only are they comfortable and cosy, they make your baby look more adorable at bedtime, if that’s even possible. For total warm and cuddly coverage, you can’t go past a swaddle. They’re designed to keep your baby’s limbs cosily tucked away from the cold and are made in comfy, breathable fabric so they maintain the right temperature for a good night’s sleep. The Ergo Pouch Sleep Suit Bag is a great place to start. On those frosty days and nights, a sleeping bag can keep your baby’s tootsies snugly stowed away from chilly air, while still allowing a bit more room to move. Icy toes will be a thing of the past with a cosy bedtime sleeping bag. To get the right fit, make sure that the sleeping bag can’t wriggle down over your baby’s shoulders. Sleeping bags should have a nicely fitting neck and armholes but no hood. Try these Sleeping Bags for starters. If you need a bit of extra coverage, but don’t want to swaddle your kiddo, it’s arm warmers to the rescue! These snuggly garments work a bit like half a cardigan and allow movement while cosily staying put. Love To Dream Arm Warmers come highly recommended. Soft, warm blankets are a no-brainer, especially if your child has outgrown the swaddling age. A blanket firmly tucked in will hopefully keep the covers on and allow your baby a good night’s sleep. Do you have any tips for a cosier winter baby at bedtime?